Inquiring minds may be interested to note that Target2 Imbalances are creeping back up. Recall that Target2 numbers largely represent capital flight from Eurozone peripheral countries to Germany. The September Target2 imbalance is €770 billion, down from 777 billion previous month, but the trend looks higher. Spain is stable at -228 billion whilst Italy has increased by 20 billion to 235.7 billion. End 2012 Italy was at 255 billion so Italian banks are clearly suffering from capital flight and heading back to 2012 crisis levels. Spain, Italy and Greece total 570 billion which represents 74% of the total Target2 imbalance. Banks in these countries are likely insolvent and headed for more difficult times. 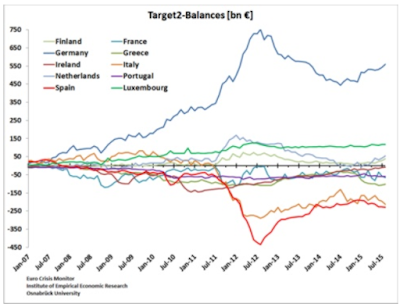 Target2 imbalances peaked at around €1 trillion in fall of 2012. That's when Draghi panicked. Despite the slight improvement this month, the trend is creeping up despite ECB QE injections totaling over €400 billion. During the same period Target2 has increased by about €100 billion. This indicates banks in Spain, Italy and Greece are still under severe pressure due to capital flight. Target2 has become a permanent funding source for insolvent banks and is the elephant in the room nobody is talking about. How are Italian banks supposed to replace Target2 funding of €235 billion. Or Spanish banks 228 billion? Anyone who has deposits in these banks should be scared stiff. Confiscation, as always, will be the solution for the central government. For a more detailed explanation of Target2, please see Discussion of Target2 and the ELA (Emergency Liquidity Assistance) program; Reader From Europe Asks "Can You Please Explain Target2?"